Orion-LØV with Sirius is a diffuser unit with VAV function, and is used as volume flow controller and diff user in ventilation systems to enable air flow rates to be set as per requirements. Orion-LØV offers excellent induction, and is ideal for variable air flow rates. Orion-LØV with Sirius is a complete measuring and control unit where the air flow rates in ventilation systems can be set as required. At the measuring station, the differential pressure is measured by using measuring rods integrated in the unit. Sirius is equipped with LHV-D3 V AV controller from Belimo. Controller specifications are provided in the table below. Full technical documentation can be downloaded from www.belimo.eu. 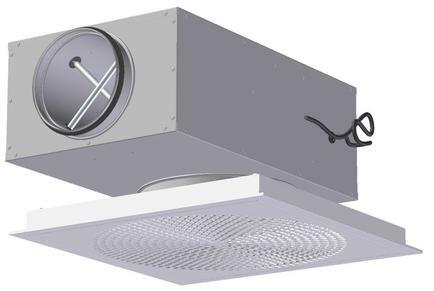 Orion-LØV features a removable front panel with LØV perforation, and is suitable for a range of ceiling systems. 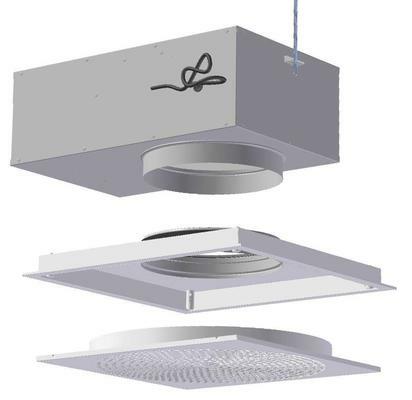 The Orion-LØV diffuser can be installed in a range of modular ceiling systems as well as in fixed ceilings. Sirius is attached to the rear of the support bracket by means of threaded rod or strap (fig. 5). In order to maintain the system’s measurement accuracy, it is important to install units with spacing as shown in fig. 6. Orion-LØV with Sirius has a built-in VAV controller for adjustment of air fl ow rates according to requirements. The damper solution will choke the pressure at high fl ow rates and will maintain a low sound level. This may reduce the need for additional dampers and sound attenuators in a duct system. Orion-LØV with Sirius forms part of the VIP-X control system for VAV, and is also available with Winsta plug-in wiring system. Motion detector can be integrated in the diff user front. Orion-LØV with Sirius can also be delivered with Belimo MP-Bus, LON, Modbus or Belimo KNX for direct BUS communication to SD systems.